I woke up this morning, prayed and meditated, and found myself sitting at my desk feeling the blues. I was so terribly sad I couldn’t contain my heart. 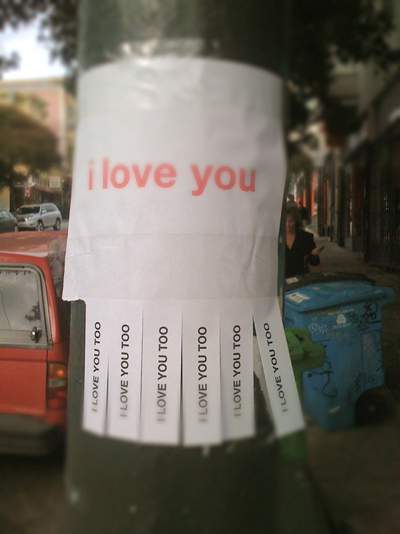 I printed a dozen copies of this love leaflet and spent the morning between 8:30 am and Noon putting them up, and documenting the response from a discrete distance. For the most part, and I’m guessing more than 90% of the people who passed the flyers – regardless of location – tend to look down, or to be lost in thought, and did not notice. Of the remaining 10%, some inspected the flyers and smiled, others took one (less than 1%) and the fate of 11 out of 12 flyers was in response to anger. The first 11 flyers met the hands of unhappiness, and were ripped from their posts, crumpled up, torn apart, and thrown either away, or on the ground. Very cool experiment, I think I’m going to give it a whirl. Interesting that you hung and observed. There’s a documentary project in this… filming and interacting with the respondents/reactants would make for compelling media. Who has a camera? I thought about filming or photographing the responses, and that’s a very good idea, but it really seemed like all I could do was to put my glasses on and hang out a discrete distance away from the flyers. filming in a location where the shot might actually be any good would more or less give the game away. That wouldn’t have been a very honest sample, more of a spectacle. Spectacle is not what I was after. That said, with some careful planning, and maybe more thoughtful locations I could manage to film or photograph the response. Perhaps I will. Thank you for the idea.